Build and debug modern web and cloud applications. Code is free and available on your favorite platform - Linux, Mac OSX, and Windows. ## Features * Meet IntelliSense: Go beyond syntax highlighting and autocomplete with IntelliSense, which provides smart completions based on variable types, function definitions, and imported modules. Extensible and customizable: Want even more features? Install extensions to add new languages, themes, debuggers, and to connect to additional services. Extensions run in separate processes, ensuring they won’t slow down your editor. ## Package parameters * /NoDesktopIcon - Don’t add a desktop icon. /NoQuicklaunchIcon - Don’t add an icon to the QuickLaunch area. /NoContextMenuFiles - Don’t add an Open with Code entry to the context menu for files. /NoContextMenuFolders - Dont’t add an Open with Code entry to the context menu for folders. /DontAddToPath - Don’t add Visual Studio Code to the system PATH. 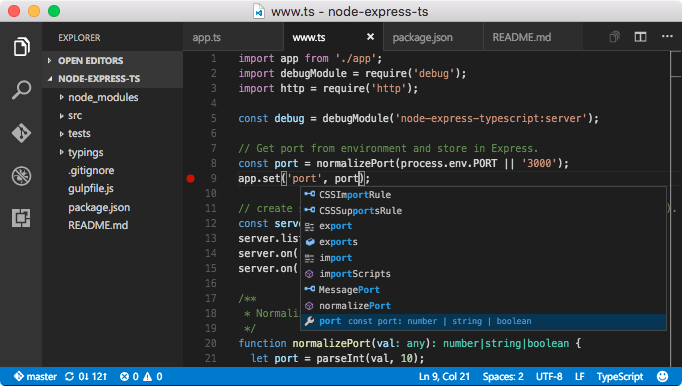 Example: choco install vscode --params "/NoDesktopIcon /DontAddToPath" ## Notes * The package uses default install options except that it adds context menu entries and Visual Studio Code isn’t started after installation.